Symptoms appear 1 to 3 weeks after being infected. Infectious period: The most infectious time is 1 to 2 days before the rash appears, but it continues to be infectious until all the blisters have crusted over. 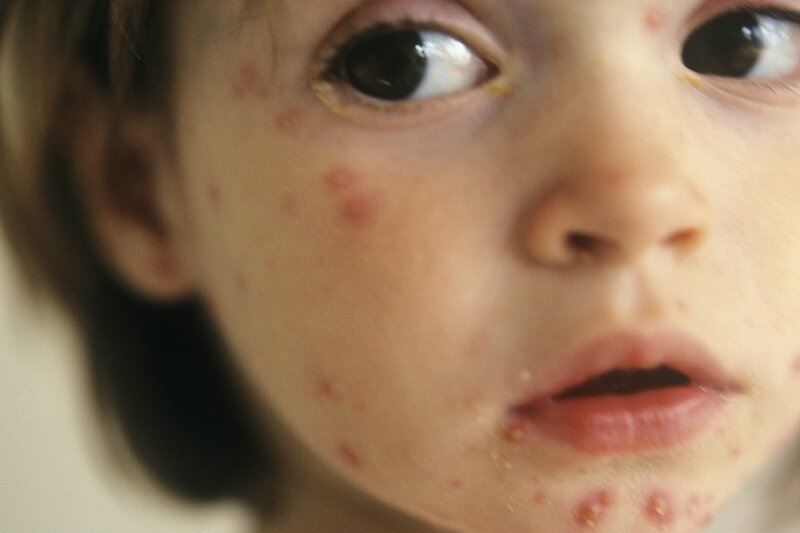 Chickenpox is a mild infectious disease that most children catch at some time. It starts with feeling unwell, a rash and, usually, a fever. Spots develop, which are red and become fluid-filled blisters within a day or two. They eventually dry into scabs, which drop off. The spots first appear on the chest, back, head or neck, then spread. They don't leave scars unless they're badly infected or picked. You don't need to go to your GP or accident and emergency (A&E) department unless you're unsure whether it's chickenpox or your child's very unwell or distressed. Give your child plenty to drink. Use the recommended dose of paracetamol to relieve any fever or discomfort. Ibuprofen isn't recommended for children who have chickenpox as, in rare cases, it can cause skin complications. Taking baths, wearing loose, comfortable clothes and using calamine lotion may help ease the itchiness. Try to discourage or distract your child from scratching, as this will increase the risk of scarring. Keeping their nails short will help. Let your child's school or nursery know they're ill in case other children are at risk. Keep your child away from anyone who's pregnant or trying to get pregnant. If your child had contact with a pregnant woman just before they became unwell, let the woman know about the chickenpox and suggest that she sees her GP or midwife. For women who have never had chickenpox, catching the illness in pregnancy can cause miscarriage, or the baby may be born with chickenpox. Symptoms appear 7 to 12 days after being infected. Infectious period: From around 4 days before the rash appears until 4 days after it's gone. Measles begins like a bad cold and cough with sore, watery eyes. Your child will become gradually more unwell, with a fever. A rash appears after the third or fourth day. The spots are red and slightly raised. They may be blotchy, but not itchy. The rash begins behind the ears and spreads to the face and neck, then the rest of the body. The illness usually lasts about a week. Measles is much more serious than chickenpox, german measles, or mumps. It's best prevented by the MMR vaccination. Serious complications include pneumonia and death. Make sure your child gets plenty of rest and plenty to drink. Warm drinks will ease the cough. Give them paracetamol or ibuprofen to relieve the fever and discomfort. If their eyelids are crusty, gently wash them with warm water. If your child's having trouble breathing, has a seizure, is coughing a lot or seems drowsy, seek urgent medical advice. Symptoms appear 14 to 25 days after being infected. Infectious period: From about 6 days before swelling in the face until about 5 days after. A general feeling of being unwell. Pain and swelling on the side of the face (in front of the ear) and under the chin. Swelling usually begins on 1 side followed by the other side, though not always. Your child's face will be back to normal size in about a week. It's rare for mumps to affect boys' balls (testes). This happens more often in adult men with mumps. If you think your child's testes are swollen or painful, see your GP. Give your child paracetamol or ibuprofen to ease pain in the swollen glands. Check the pack for the correct dosage. Give your child plenty to drink, but not fruit juices, as they make the saliva flow, which can worsen your child's pain. There's no need to see your GP, unless your child has other symptoms, such as a severe headache, vomiting, a rash, or swollen testes in boys. Mumps can be prevented by the MMR vaccine. Symptoms appear 1 to 20 days after being infected. Infectious period: A few days before the rash appears. Children are no longer contagious when the rash appears. It begins with a fever and nasal discharge. A bright red rash, like the mark left by a slap, appears on the cheeks. Over the next 2 to 4 days, a lacy rash spreads to the trunk and limbs. Children with blood disorders such as spherocytosis or sickle cell disease may become more anaemic. They should seek medical care. Make sure your child rests and drinks plenty of fluids. Give them paracetamol or ibuprofen to relieve any discomfort and fever. Pregnant women or women planning to become pregnant should see their GP or midwife as soon as possible if they come into contact with the infection or develop a rash. Symptoms appear 15 to 20 days after being infected. Infectious period: From 1 week before symptoms develop until up to 4 days after the rash appeared. It starts like a mild cold. A rash appears in a day or 2, first on the face, then on the body. The spots are flat and are pale pink on light skin. Glands in the back of the neck may be swollen. Your child won't usually feel unwell. It can be difficult to diagnose rubella with certainty. Give them paracetamol or ibuprofen to relieve any discomfort or fever. Rubella can be prevented by the MMR vaccine. Keep them away from anybody who's in the early stages of pregnancy (up to 4 months) or trying to get pregnant. If your child has had contact with any pregnant women before you knew about the illness, you must let the women know, as they'll need to see their GP. Symptoms appear 6 to 21 days after being infected. Infectious period: From the first signs of the illness until about 3 weeks after coughing starts. If an antibiotic is given, the infectious period will continue for up to 5 days after starting treatment. Antibiotics need to be given early in the course of the illness to improve symptoms. The symptoms are similar to a cold and cough, with the cough gradually getting worse. After about 2 weeks, coughing fits start. These are exhausting and make it difficult to breathe. Younger children (babies under 6 months) are much more seriously affected and can have breath-holding or blue attacks, even before they develop a cough. Your child may choke and vomit. Sometimes, but not always, there will be a whooping noise as the child draws in breath after coughing. The coughing fits may continue for several weeks and can go on for up to 3 months. Whooping cough is best prevented through vaccination. If your child has a cough that gets worse rather than better, and starts to have longer fits of coughing more often, see your GP. Whooping cough can be prevented by childhood vaccinations. It's important for the sake of other children to know whether or not your child has whooping cough. Avoid contact with babies, who are most at risk from serious complications.